Merab Abramishvili is a Georgian painter who was born in 1957. In his childhood he often traveled with his father, art historian Guram Abramishvili, to visit museums and churches. The beauty of Georgian medieval church painting was engraved in his memory. Based on his love for these works he used tempera and gesso technique in his own art. The end of the 1980s and the beginning of the 1990s was a dramatic and contradictory period in the history of Georgia. The collapse of theSoviet Union was accompanied by painful experiences: war, destroyed cities, sacrificed lives and refugees. Paradise is a recurring theme in Abramishvili’s art. In the painting above the decorative surface consisting of various ornamental motifs is the first thing to attract one’s attention. Then, step by step, the viewer starts to discern various plants and living creatures that inhabit the Garden of Eden: palm tree and apple tree, deer and panther, peacock and dove, men, women and angels. Together they form a harmonic picture of the co-existence of plants, animals, humans and heavenly creatures along with East and West, North and South, earth and heaven, water and fire, love and peace. Even today the people who lived in the former Soviet Union are struggling with a Soviet mentality in themselves. The experience of Soviet life was unique, but fruitless. The shadows of Paradise are pink. 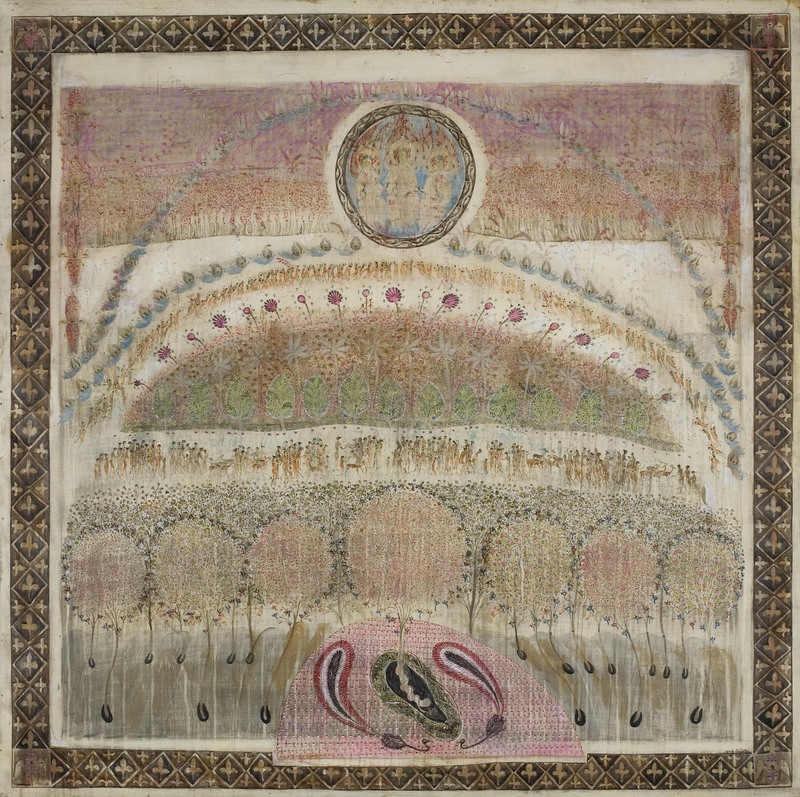 Merab Abramishvili: Paradise, 2005-2006, 152 × 152cm, tempera and gesso technique. 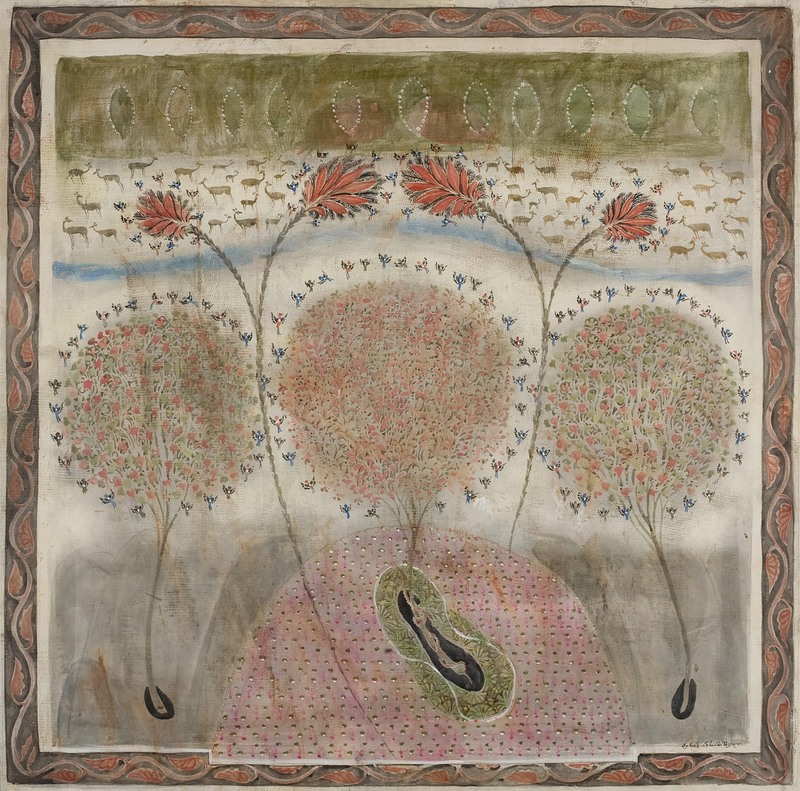 Merab Abramishvili: Paradise, 2005-2006, 75 × 75 cm, tempera and gesso technique. Merab Abramishvili (1957 – 2006) was born in Tblisi, Georgia. He studied at the Tbilisi State Academy of Art, Georgia, Department of Drawing. His artwork is located in many collections in Georgia and abroad, such as the National Gallery of Art, Tbilisi, LudwigMuseum,Cologne, Germany and private collections in Finland and the USA. His father was an academic and art critic with strong interest in ecclesiastical architecture in Georgia. His expeditions which Merab accompanied him on influenced the direction of his work enormously, especially the frescoes at the Church of the Assumption of the Virgin in the village Ateni, near the town of Gori in Georgia, built in the 7th century. Abramishvili called his painting 'stories of peace in this world'. Contact: levanpao23@gmail.com (Merab Ambramishvili's son).